Benjamin Loomis was a Civil War veteran and a successful inventor. One of his most interesting patents, from February 1866, is for a folding revolver. From the patent description, it’s obvious that safety was Loomis’s main priority. “The object of my invention is to secure greater compactness and safety in revolving cylinder-pistols than has been obtained heretofore,” Loomis wrote. When the user folds the grip forward, the trigger also folds forward to rest flush with the frame. The revolver features a coiled, circular mainspring with an enclosed hammer. 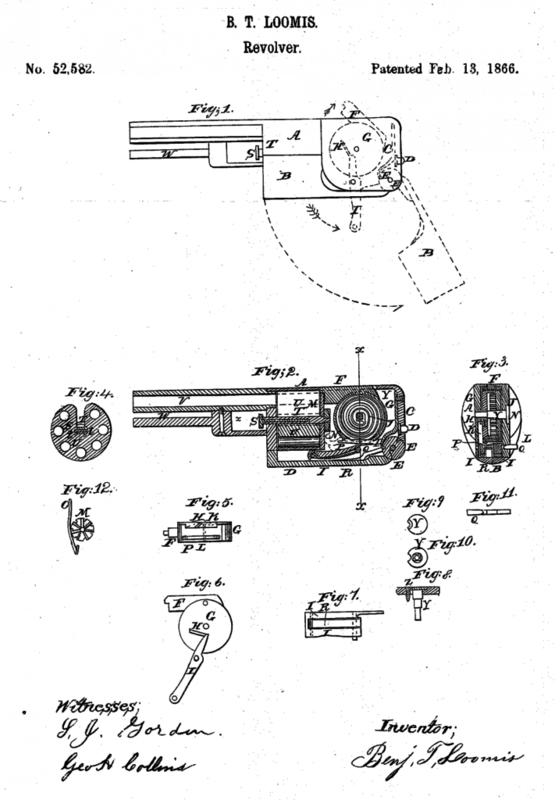 The patent drawings indicate an unusual cut in the cylinder, into which the hammer rests in order to lock the cylinder while the pistol is folded. The gun doesn’t look terribly ergonomic and appears to chamber a very small-caliber round. To reload, you have to remove the cylinder. I’ve been unable to find any mention of Loomis selling his design. He went on to hold a number of successful patents, including one for water filters. He retired in 1896.